ZARQA – HE Dr. Talal Abu-Ghazaleh patronized ‏the ceremony organized by Al Zarqa Municipality on the occasion of the 57th Birthday of HM King Abdullah II held at the Royal Urban Village in Zarqa. During the event, Dr. Abu-Ghazaleh visited the Municipality Council and was received by Eng. Ali Abu Al Sukkar, Mayor of the Municipality, in addition to members of the Municipal Council and Sheikhs and prominent figures of Zarqa city. 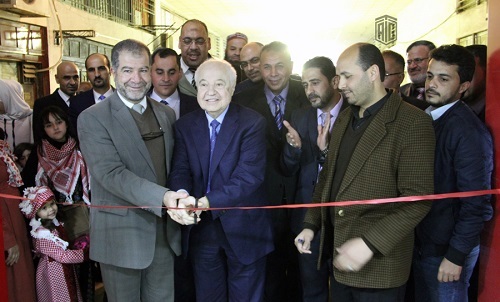 Moreover, Dr. Abu-Ghazaleh inaugurated Talal Abu-Ghazaleh Knowledge Station which was furnished and equipped with TAGITOP devices and free Internet access provided by Talal Abu-Ghazaleh Organization’s own Cloud. 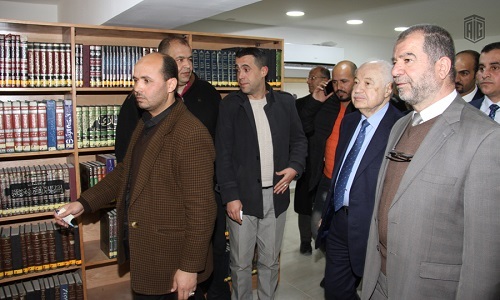 Furthermore, Dr. Abu-Ghazaleh inaugurated the Community Service Center and Public Library which was supplied with special editions of Talal Abu-Ghazaleh Organization publications including books, dictionaries, brochures, and references. During the ceremony, Eng. Abu Al Sukkar welcomed Dr. Abu-Ghazaleh, highlighting Jordan’s achievements under the leadership of HM King Abdullah II Ibn Al Hussein and pledging his loyalty to the King and country. In his address, Dr. Abu-Ghazaleh recalled lessons learnt from His Majesty the late King Hussein bin Talal, underlining Jordan’s enormous accomplishments under the reign of HM King Abdullah II ibn Al Hussein who has continued the blessed march of his father during the last 20 years. In addition, Dr. Abu-Ghazaleh underlined the Hashemite leadership's achievements and the mutual loyalty between the people and leadership describing the latter to be a role model in his wisdom, moderation and tolerance. Meanwhile, Dr. Abu-Ghazaleh extended his best wishes and congratulations to His Majesty King Abdullah II on His Birthday, expressing appreciation to the Municipality Mayor and cadres for their efforts in serving the local community. At the end of the ceremony, Dr. Abu-Ghazaleh honored a number of activists in Zarqa Governorate, as well as Warrant Officer Reyad Al Mashaqba for his efforts in saving two children from Al Malih District’s winter flooding.